Unthinkable technologies – or thinkable only in Hollywood – have been emerging rapidly in the last decades. One incredible example and recently spread are drones. Drones are unmanned aerial devices that make a noise similar to drones, the male bee. Drones were originally created as a strategic war artifact, but now they have all kinds of applications, formats, and sizes. Some are so tiny that fit in your hand (Fig 1). Fig. 1. 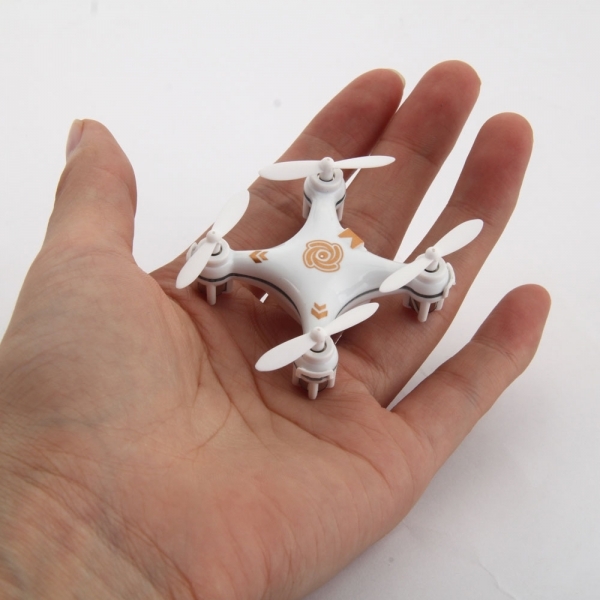 You can fit a drone in your hand. Drones are polemic objects because they were originally created for military purposes. The USA has surveyed and attacked Afghanistan and Iraq using drones. In fact drones have seem to become really famous during the chase of Bin Laden. Several people also argue that the use of drones can shape wars to worse by reducing people’s empathy due to the lack of human-human contact (beats us to try to imagine an empathic war….). The use of drones also faces some legislation issues in several parts of the world. A few countries have clear legislation regarding the use of drones, its maximum flight height, size and permitted areas; in most case drones are not allowed to fly near airports and populated areas. The association of GPS, smaller and more accurate cameras, thermal infrared cameras, and other sensory devices to drones expanded their uses. Drones have been used in cinema, advertisement, agriculture, and sports. Their widespread use is associated to their cost-benefit, as drones are relatively cheap, depending on what you need, you can purchase one for less than U$ 2,000. Fig. 2 Dugong identification in Australia. Source: Hodgson et al. 2013. Apart from these more popular uses we are all familiar with, drones are also helping solve problems in the biological sciences, and the integration among marine conservation biologists, computer scientists, and engineers are providing a handful of new applications for drones. For example, aquatic organisms use to be difficult to study and require methods such as underwater visual censuses, direct sampling, and aerial surveys, which tend to be all expensive and logistically difficult. Surveys of marine megafauna, in many cases, are already done with planes or helicopters, which are not only really expensive, but also noisy, which can disturb the animals being studied and interfere with the results. This is where drones, as predicted, come in handy: they come at a fraction of the cost of a plane, sound bug-like, and fly at lower altitudes, therefore providing more accurate images. In the complex Amazonian environment drones are being used to map the distribution of the Amazon River Dolphin over a large area. This work is just beginning, but it has already provided an impressive amount of information at a low cost. 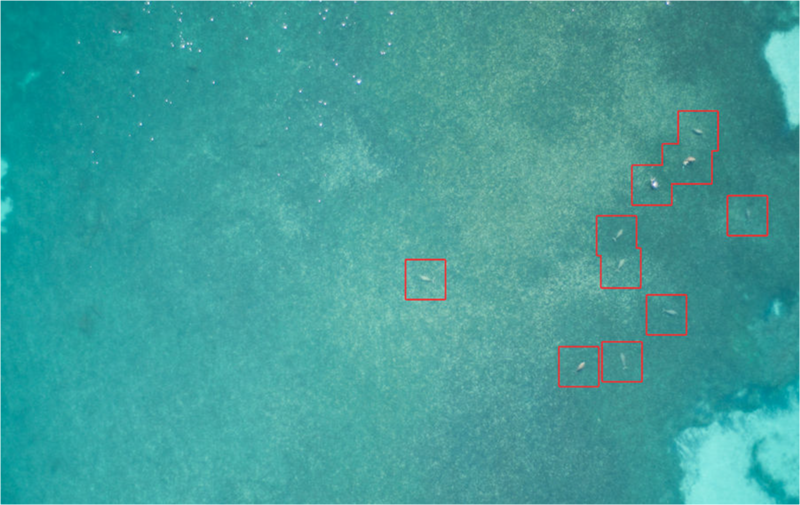 Along the Australian coast, drones have counted hundreds of Dugongs during only seven flights covering 1.3km² each (Fig 2). 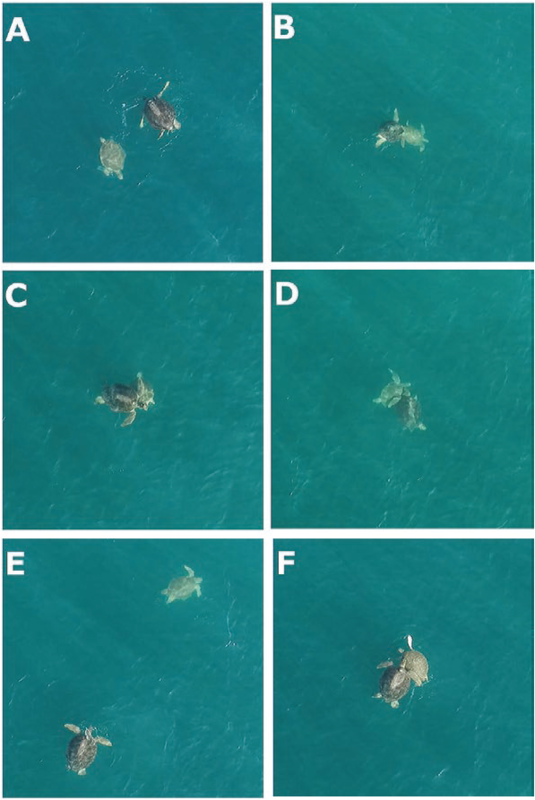 Green Turtles have been successfully located and identified, and, even more impressive, their mating behavior has been also described using drone images (Fig 3). And the list goes on: drones have been used to map seabed coverage and nursery areas for juvenile fish, to detect body condition in humpback whales during breeding events, to survey cetacean in Timor Leste and to study sharks and rays densities in reef systems. Those who study small organisms can also benefit from the use of drones: for example, they have provided centimeter-scale images of reefs. The potential of drones seems endless. They have been used to empower human communities and aid conservation: with proper training, people can use small drones to monitor forest use by local communities under a community-based management system. They can also be easily applied to monitor fisheries. In Belize, for instance, the government has compromised to use drones to fight illegal fishing. Two main flight methods are usually used in biological surveys and conservation monitoring. The first one requires the pre-programming of a grid to be covered during a flight, which is usually done with fixed-wing drones. This is a more systematic approach and can be used to get abundance and distribution data of a given species. The second approach requires a ground pilot to maneuver the drone and choose specific locations, individual or small groups of animals or areas to monitor. In this free-flight method rotary-wing drones are used, because these are more flexible and can fly at even lower heights. Just as some other new technologies developed along the last years, the challenge now is how to analyze an enormous volume of data that drones provided. Nevertheless, a new path has been set to give drones are much more positive use than what made them initially famous for. Anderson, K., & Gaston, K. J. (2013). Lightweight unmanned aerial vehicles will revolutionize spatial ecology. Frontiers in Ecology and the Environment, 11(3), 138-146. Bevan, E., Wibbels, T., Navarro, E., Rosas, M., Najera, B., Sarti, L., ... & Burchfield, P. (2015). 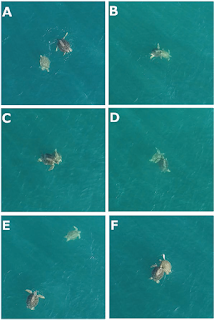 Using Unmanned Aerial Vehicle (UAVs) Technology for Locating, Identifying, and Monitoring Courtship and Mating Behavior in the Green Sea Turtle (Chelonia mydas). Herpetological Review, 47(1), 27-32. Chabot, D., & Bird, D. M. (2015). Wildlife research and management methods in the 21st century: Where do unmanned aircraft fit in? 1. Journal of Unmanned Vehicle Systems, 3(4), 137-155. Chirayath, V., & Earle, S. A. (2016). Drones that see through waves–preliminary results from airborne fluid lensing for centimetre‐scale aquatic conservation. Aquatic Conservation: Marine and Freshwater Ecosystems, 26(S2), 237-250. Hodgson, A., Kelly, N., & Peel, D. (2013). Unmanned aerial vehicles (UAVs) for surveying marine fauna: a dugong case study. PloS one, 8(11), e79556. Kiszka, J. J., Mourier, J., Gastrich, K., & Heithaus, M. R. (2016). Using unmanned aerial vehicles (UAVs) to investigate shark and ray densities in a shallow coral lagoon. Marine Ecology Progress Series, 560, 237-242. Paneque-Gálvez, J., McCall, M. K., Napoletano, B. M., Wich, S. A., & Koh, L. P. (2014). Small drones for community-based forest monitoring: An assessment of their feasibility and potential in tropical areas. Forests, 5(6), 1481-1507. Very nice post! The use of Drones is a really promising tool for Ecology. Conservation Drones NGO is a great example of application of drones in Conservation. Are you thinking in using to study fisheries in Brazil? ?